Dr. Jekyll is a simple man: he just wants to take a nice, peaceful stroll to his marriage, but the entire city is up in a civil war. Fearing for his ability to walk right, Jekyll manipulates time to conveniently have every obstacle out of the way, not fearing any consequences to the laws of physics and space-time continium in the process. This is 2173 frames faster than the previous cancelled run. Use the stair glitch to skip the majority of hasards. This is needed to keep more METER for barrel boosting in Screen 6. I choose this screen because it leads to a rather delicate result in Screen 6 and is the most easily accesible stage to stair glitch on. This is a little bit slower than the normal way, but I can't do much about it. New tech was used in Screen 6. You see, the bombs in this screen have a very, very wide explosion radius: they can only be dodged by perfect walking left and jumping. The main obstacle was the barrels. But instead of trying to manipulate good barrel RNG in order for them to not come (which wasted quite the frames in the process, because that lead to even worse barrel RNG after the bomb; I could not jump after the bomb explodes for a bit), I simply chose to befriend the barrels. My objective is that, when a bomb is placed, Jekyll gets to a safe position as fast as possible. So I manipulate barrels to be on Jekyll the instant he touches the bomber (so he places his bomb). This way, the barrel knocks me back out of safety, and I can continue peacefully manipulating RNG. I also manipulate a barrel to transform into a dog at the start of the level because why not. After the first stair glitch, this gets a lot simpler: I simply hold Left to avoid bombs. After entering another stair while stair glitching, I get a perfect clip and walk right to safety. - mini stutter stepping: when you hold Right, Jekyll doens't actually move forward; he cycles through a three frame long animation, goes forward on the fourth frame, then starts another 'going' forwards animation. However, if you stop for 1 or 2 frames after executing this animation, you will still advance, but without fully holding Right, and consecutely never stopping. This method, hovewer, cycles the RNG very inconsitently, and only works once, until the RNG has done a full cycle. - stutter stepping: same thing as above, but stop for 3 frames (= 1 'ingame' frame). - jumping: jumping is as fast as stutter stepping, but causes less lag when there are entities on screen, for some obscure reason. I always try to jump as little as possible, and prioritise stutter stepping when it is faster, because it looks smoother. Occasionally, the kids will fire a bullet. This is simply avoidable by turning left for one frame then right again: this changes your hitbox slightly, just enough to pass over the bullet. When Jekyll takes damage, he is normally sent flying a varying amount of distance back, based on what hit him: bombs can cause him to be flung several meters across, floating the entire way through. This is why I try to make a quick damage boost: as in, instantely falling as soon as I get hit, instead of floating. When Jekyll scrolls the screen enough so that he is barely able to fit between a 'step' and the corner of the screen, lands on that spot facing left, turns right, then jumps, he will clip out the screen and reappear at the very right of the screen. The most obivious advantage is being able to bypass dog-jumping, since you scroll past them, being at the right of the screen. However, this trick is sparingly used in the run because of its tremendous setup time (300 frames) and its utility is limited where luck manipulation can do better work in a shorter time. Massively abused in the last screen. 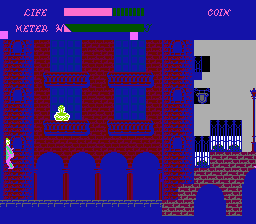 When you get stuck at the very right of the screen via the stair glitch making it so Jekyll has half of his severed body on the very left of the screen and its other half on the right of the screen, simply holding Left will change Jekyll's hitbox location from the very right of the screen to the very left of the screen. Used to skip all bombs in Screen 6. Note that the bombs in Screen 6 still hit Jekyll from the back, but he only takes LIFE damage as a wierd result. If you do the stair glitch, then jump into another stair, you will end under the ground. Walking for a bit, then jumping again pushes you again, putting you at the very right of the screen, at the very right position for Jekyll to dodge every obstacle in the game, including bombs. By turning left at the exact frame you get hit, you get knocked back while facing left. This doens't have any use, but it used when it doens't waste any time for extra style. By having perfect timing and RNG, you can completely despawn some sprites from appearing. This is used to despawn the kid in Screen 1 and one of of the spiders in Screen 2. Pink bombers are crucial: they deal massive damage with their bombs, as well as causing dogs and cats to wake up and civilians to panic and deal damage in very frequent waves. Most of these effects can be dodged, but there is one who's crucial to despawn: the pink bomber at the start of Screen 3. Sadly, these are dependant on an internal timer, and I have to wait 6(!) seconds at the end of Screen 2 to despawn that pink bomber. There is another way to not make pink bombers appear: keep a singer on-screen. Singers share their properties with pink bombers, as in they occupy the same slot in memory. Effectvely, keeping a singer on-screen will allow no pink bombers to spawn. This is also why bomb snapping happens. In Screen 6, if you scroll a singer on screen while a bomb is on screen, the bomb will reset and snap to your position, and the pink bomber will not come back. Very useful trick. When approaching a bomber with the stair glitch, he will often be very confused as in where to walk to, taking him extra time to leave the screen. Most useful in Screen 6 to maximise the time pink bombers are on screen; as long as one is one screen, the next cannot place its bomb. For very obscure reasons, stair glitching in Screen 5 and entering Screen 6 at a very specific frame will give you a rather particular palette. You might notice there are two types of health: LIFE and METER. When METER is empty, you transform into Hyde, which is to be avoided at all costs. The game isn't supposed to be completed like that, obiviously; there are no heals, and you have to complete the entire game with one health bar, which is really tricky. This is a whopping 2173 frames than the previous run, and 4316 frames faster than the current published run, even accounting the large emulation differences. I think my work is done as defining Dr. Jekyll as one of the most impressive speedgames of history. Enjoy watching. Samsara: Well, this certainly is a strange case of Dr. Jekyll and Mr. Hyde. THANK YOU, GOODNIGHT! Okay. The run has received surprisingly good votes, currently at a 71% as I make my judgement (9 yes, 5 meh, 2 no), and I'm assuming it's thanks to all the new tech on display. It's a quite solid improvement over a run that, in all honesty, didn't even feel nearly that improvable. It was actually an entertaining watch this time around, and the majority of voters did seem to agree. However, votes alone are not enough. The posts in the thread were a little less receptive, with all of them being meh votes or "weak yes", highlighting that the run was indeed more of an entertaining watch, but not enough to escape the Vault. I'm inclined to agree. There's not much you could do to save this game, unfortunately, even if you distort the space/time continuum and enter the stereoscopic realm for the last stage. I'm accepting this as an improvement to the published run. Congratulations xy2_. I hope you're happy with yourself and your higher movie. Spikestuff Puns & Barbie. Samsara, remind me why I publish things you judge.